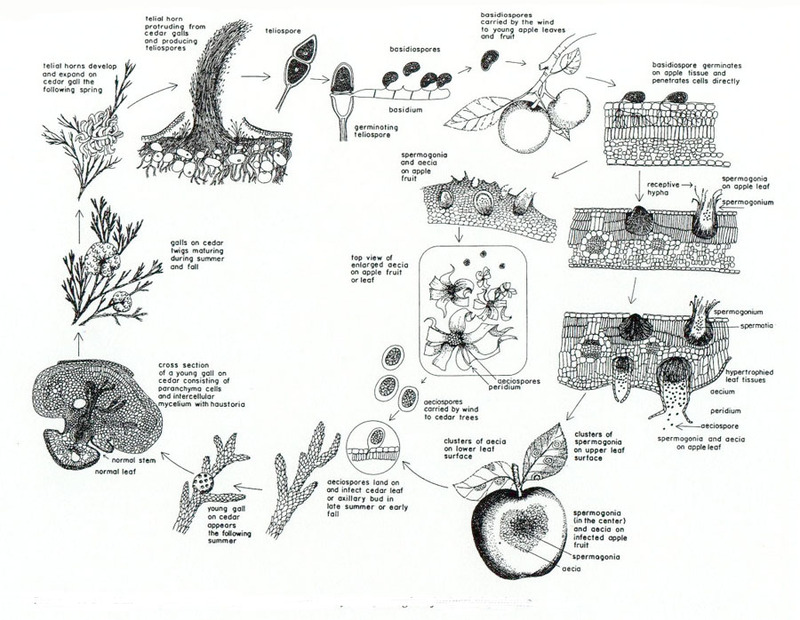 From the Archives: This is a re-post, but a story I really love to share. 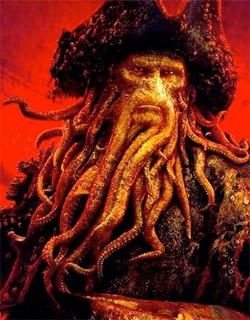 Move over Davy Jones, you aren’t the only one with slimy tentacles. 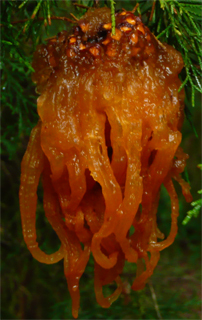 In fact, the orange growth I found in the cedar trees at the NC Museum of Life and Science could have been inspiration for the Pirates of the Caribbean movie’s character. I took these photos on May 19, 2010, after a few days of very heavy rain. I was stunned by the intricate design and beauty. 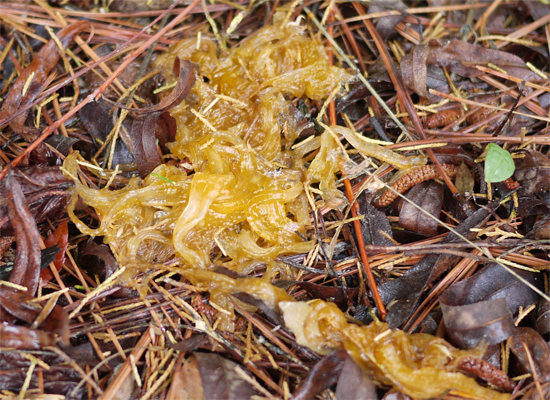 The spectacular mass of glistening, glutinous tendrils contrasted sharply in color with the cedar green on that damp morning. But I had no idea what I was looking at. So, I just tried to get some good shots to identify later. Greg Dodge, the ranger at the NC Museum of Life and Science answered my email query quite quickly (wow, that’s pretty good alliteration for the letter q). 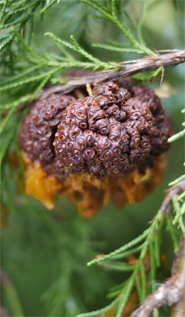 He recognized my photo instantly as a Cedar-Apple Rust gall–a fungal disease. 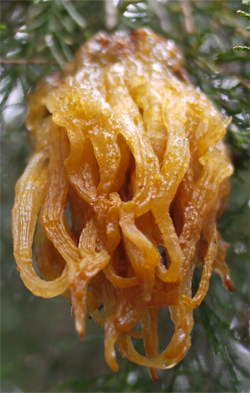 He confirmed my hunch that the recent deluge had coaxed the spectacular tendrils out of the gall that had been quietly developing in the branches of the cedar tree for the past year. 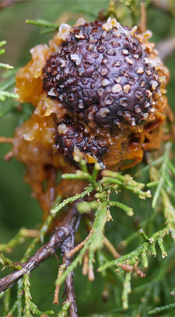 Cornell University’s Plant Disease Diagnostic Clinic has the best description of the life cycle of Cedar-Apple Rust, but I think I captured some fantastic photos of the telial horns. A few days later I went back and looked for the Cedar-Apple Rust galls again. By now, the orange telial horns had mostly disappeared (dropping to the ground), and the gall which had been developing during the previous year in anticipation of its final spectacular spring show was clearly visible. This entry was posted in NC Museum of Life & Science, Photographs, Plants on August 9, 2014 by Karyn Traphagen.